As I mentioned before and will probably mention again, the Shadow was in a right old state for a still running bike. All of the painted parts where showing I suppose what would be an expected level of wear and tear for a bike it’s age, especially given it most likely had lived outside for it’s last few years at least. All the paint, though intact, was dull, scuffed and/or flaky. 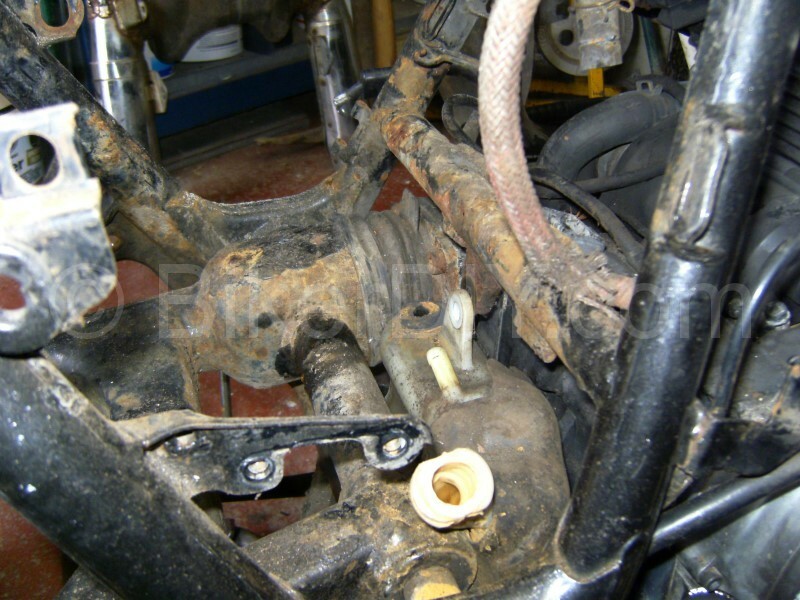 Until I got into by the battery area that is, where I found bare rusted and pitted steal. I’m guessing battery acid might have contributed to the accelerated ageing in this area. There is more of an issue around the whole battery compartment as well which I intend to cover elsewhere but right away I was looking at badly exposed and pitted steel especially on the cross bar in front of the battery/air filter box, and a couple of bad rust spots where someone had cut out some mountings and left the steel unprotected. 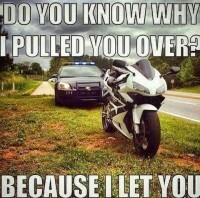 Like I say, a right old state. 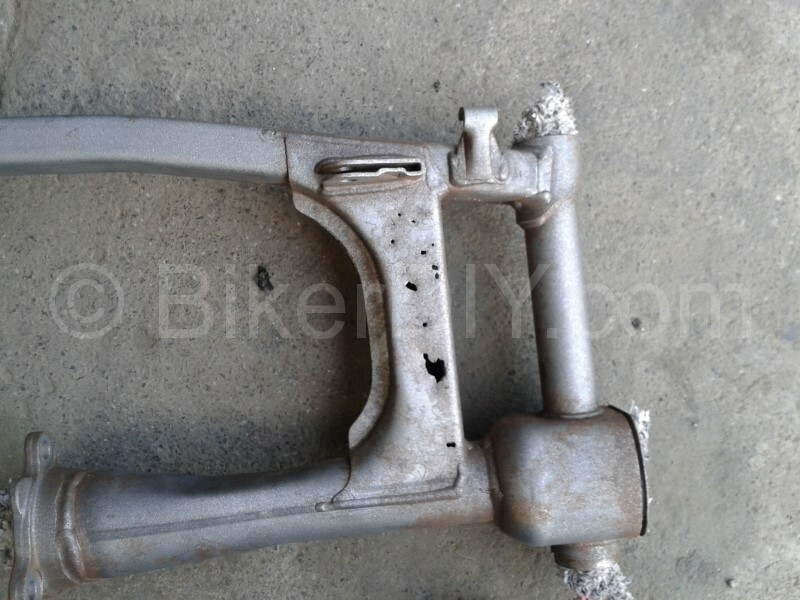 I also discovered a piece of the frame down at the lowest point on the cradle (right behind the kickstand) had rotted away completely. Unfortunately I neglected to grab a picture (again) of before I welded it up but here’s what the repair looked like before it was coated. While it’s not the almost invisible repair that a good welder/ fabricator might produce, I’m happy that it has replaced any lost strength in the section and given that it’s mostly only visible from underneath the bike then there shouldn’t be many opportunities for it to be seen anyway . There probably wasn’t much on the bike which hadn’t suffered from corrosion but at least I hadn’t found any sign’s of crash damage to the main frame of the bike. The dash was wrecked somehow and, as I mentioned above there is a bit of an issue around the battery compartment but as far as the load bearing structure of the bike’s frame goes it was mostly all there and just rusted in spots (lots and lots of spots). 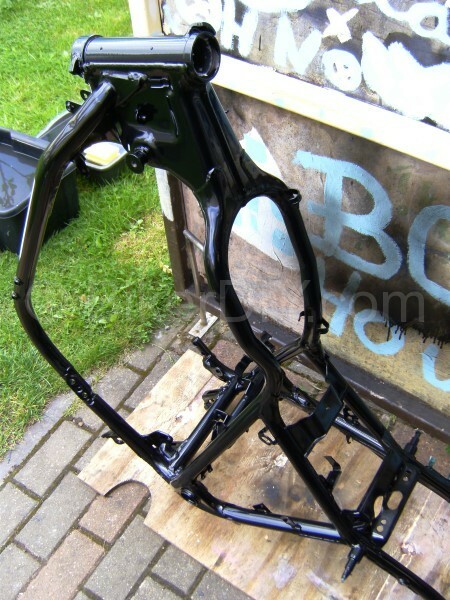 So with strip down well under way and it already being obvious that the frame and a few bit’s where going to need coating with something, it was time to consider the options for said coating. The instruction from the Shadow project design team (i.e. 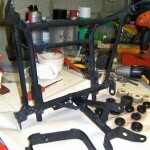 BikerBabe) was to make it black :), so I decided I would try getting as much as possible powder coated. My main reasoning behind this was that I had read that it was the best job for coating aluminium parts especially, and aside from the frame and swingarm a lot of the most visible parts of the bike are made of aluminium. Now apart from chatting once or twice with some guy’s from Tallaght powder coaters as I browsed stall’s at the Bikefest and the likes, I knew very little about what’s involved in getting item’s coated this way or what kind of finish I could expect. 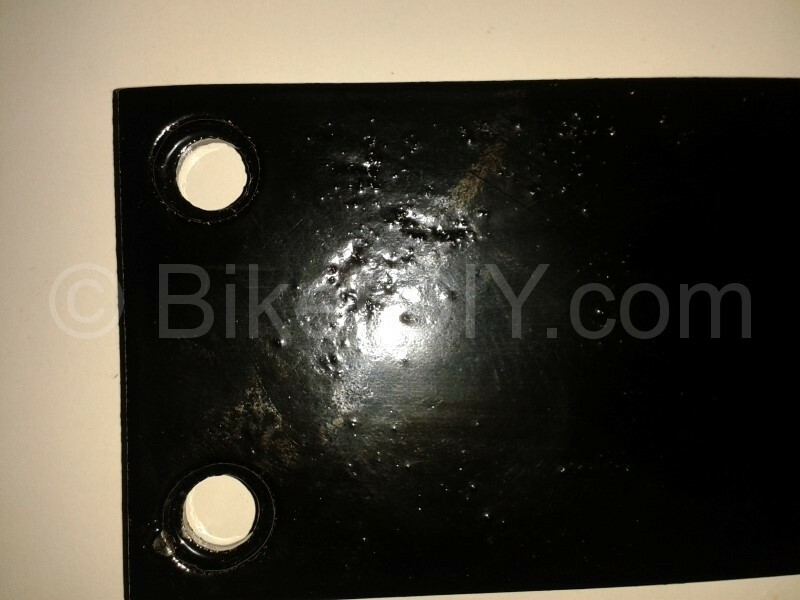 So I cast about for any info/advice on the subject and was soon shown some carrier parts on a bike that had been re-coated by a crowd near Athy, Co Kildare and for what would be considered by most to be a reasonable fee. 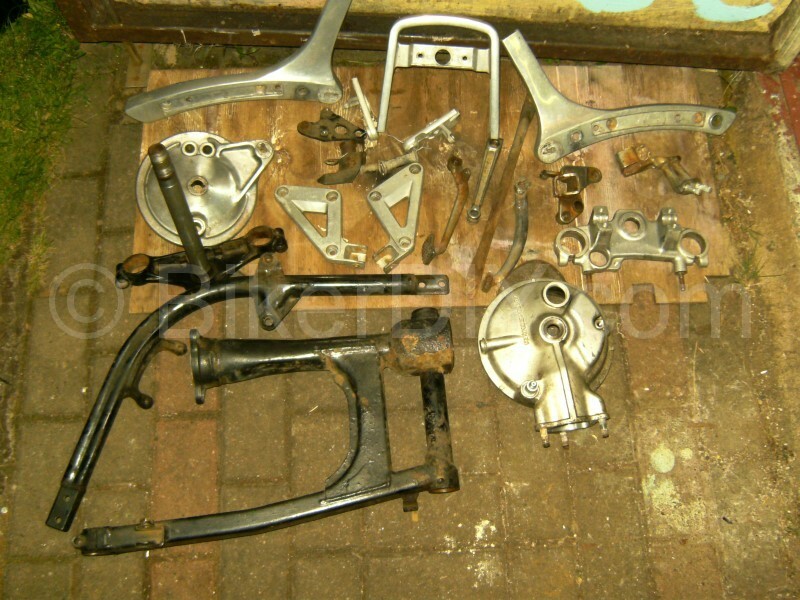 So I rang John at 087 2930062 and was told that a regular size motorbike frame and it’s few bit’s and pieces could be done for a standard fee of €120 provided they all arrived to be done together. Happy with that I set to on getting all that I wanted powder coated black separated from anything I didn’t want powder coated black. 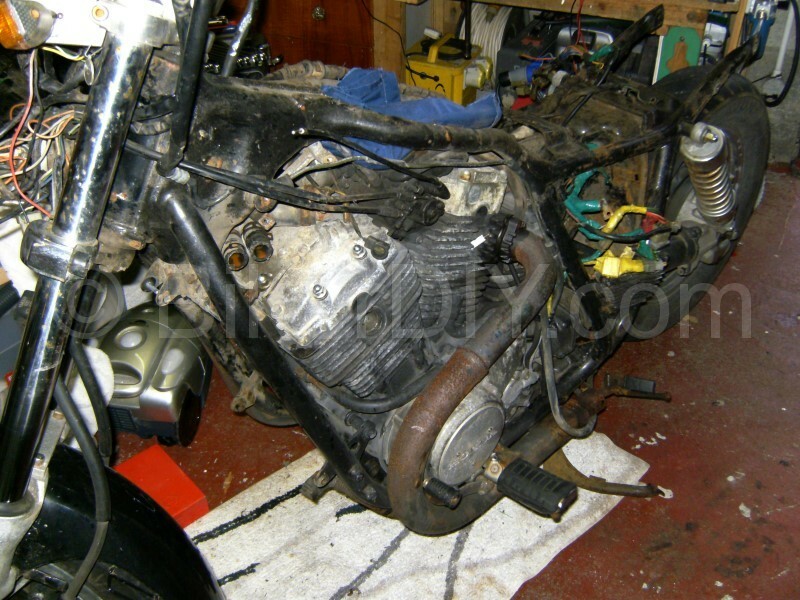 And given that the instruction was to make the bike black then it added up to quite a bucket of bits and pieces by the time I was finished. In it apart from the frame, sub frame and swing arm where the rear drive casing, rear brake hub and spacer, the top and bottom steering yolks, the fork brace, the front foot peg brackets, the gear shift lever, the back brake pedal and bracket, the rear foot peg hangers, the headlight brackets, the rear brake brace, the rear brake arm and the rear seat back rest parts (3 of). I had hoped to get the front fork outer tubes in as well but the seals and associated rings and clips where putting up a fight and rather than damage it in a rush I left them for another time, and probably another fee but never mind. So the next day I headed to their shop, which is just a little out the Monasterevin road from Athy town in part of an old foundry complex, with this bucket full of metalwork, fully prepared to find out that something about some of the stuff couldn’t be dealt with or at least surely that an extra charge on top would apply for so many extra bit’s and pieces. When I presented the bit’s to the guy’s they went through every part one at a time with me to check pertinent details such as which were machined faces for bearings and seals and the like and where the blasting media and/or powder coat needed to be kept out of and the like. For me the conversation was very interesting as I had just as many questions about the process as they did about my parts, and fair play to them they gave proper explanation to anything I asked them. I find this kind of thing is important to me. 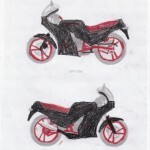 If the person I’m handing my bike project parts to, is willing and able to explain what’s going to happen to my parts while in their care then I am left feeling confident that they are paying attention to what they are at. At the end of the conversation they confirmed the parts would be ready in three day’s, he would be charging the standard fee (€120), and that they would ring me as soon as they could be picked up. I left the place happy I had gained some little knowledge about the powder coating process and most importantly, that the parts where in safe hands. 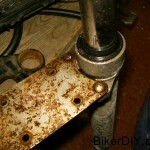 The swing arm hadn’t faired as well. While it was being blasted clean, the media had exposed how thin the underside of the cross section had become. 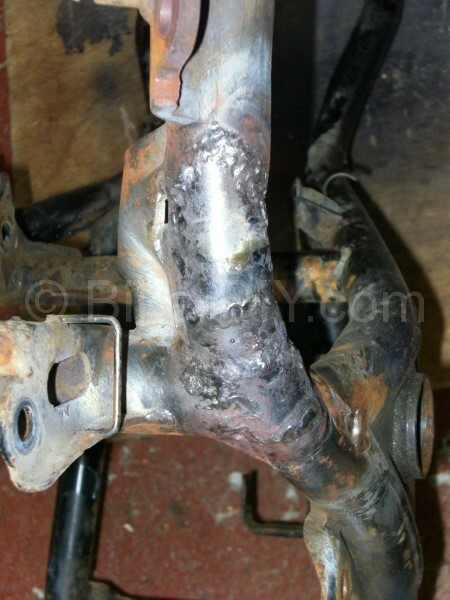 And, while they where willing to continue and coat what was left of the swingarm if I wanted them to, they had figured (quite rightly) that I would want to look at a repair first instead. So I did a swap with them and I took away the swing arm to see what I could do with it and gave them the two fork outer tubes in it’s place. Two day’s later I get the call to say everything was ready and when I got the parts back I was, on the whole, very very pleased. 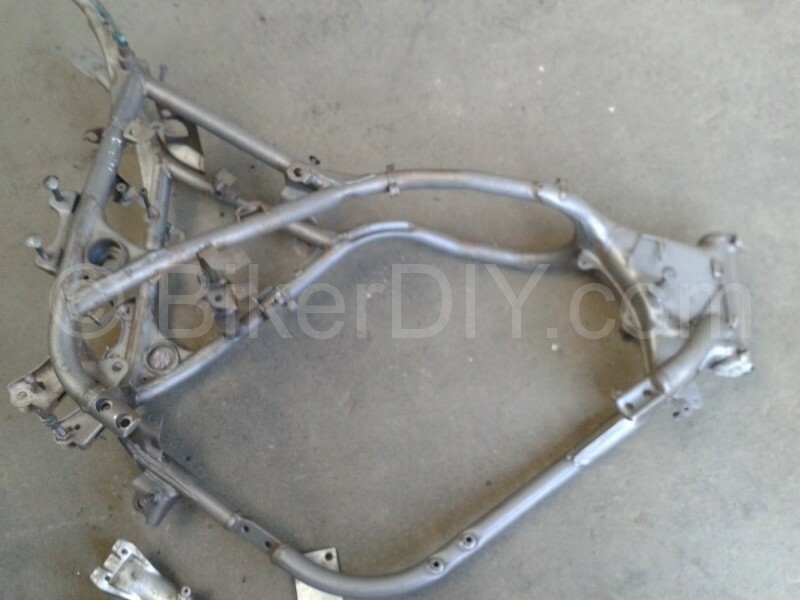 The white metal parts came up with a mirror finish with the exception of the fork brace. I’m pretty sure the piece isn’t Honda original and the metal apparently contains an impurity that causes the coating to rise once the part is heated to the 180°C curing temperature. They apparently had a couple of goes at it using blasting and an etching compound but it still came up every time the piece was heated. In the end because it’s not an original Honda Shadow part I’m not too bothered about it but I will still have to find an alternative part that will take a powder coating or a coating that will work and match in it’s place. The frame also came out near perfect. And the “near” shouldn’t be taken as a reflection on the quality of the coating work. It’s just an apparent fact that no sprayed on coating is going to get into all of the tiny little gaps and crevasses on a frame like this one, so some little touch ups will be required to get into some of the smallest gaps, but this is me being particular and in fairness, if I manage to get the bike all back together without causing the need for a few touch ups myself, I’ll be quite surprised. So now with the bulk of the metal work coated it’s time to start getting on to the more fun parts. 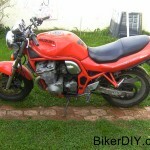 There is a shed load of work to be done yet but at least from here is where it starts to all look like a bike again. 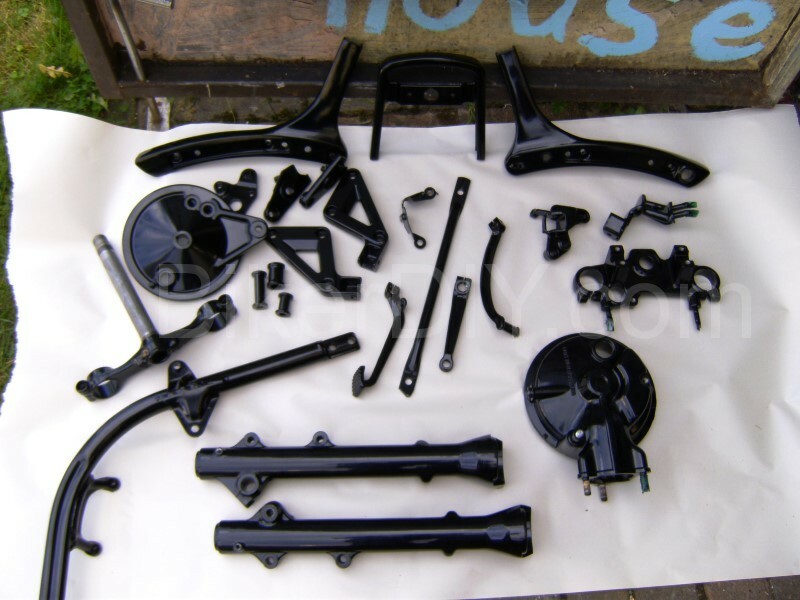 FYI this powder coating colour is known as Jet Black (RAL 9005). You can get John at 0872930062. They do a bike frame and it’s attendant bit’s for a standard fee of €120 provided all of it arrives at the one time (correct as of October 2014). I am not affiliated in anyway with these lads and you must make up your own mind on who you get to do your work for you but for my part I must say I will be perfectly happy to go back to them with the next bit’s that I need powder coated. Rust removal. The electrolytic method.